Set sail into your future, with wedding rings presented on deck in a beautiful shell and exchanged as the sun sets. Cut your exquisite wedding cake, created by a personal chef, and share a wine dinner that is tailor-made just for the two of you. 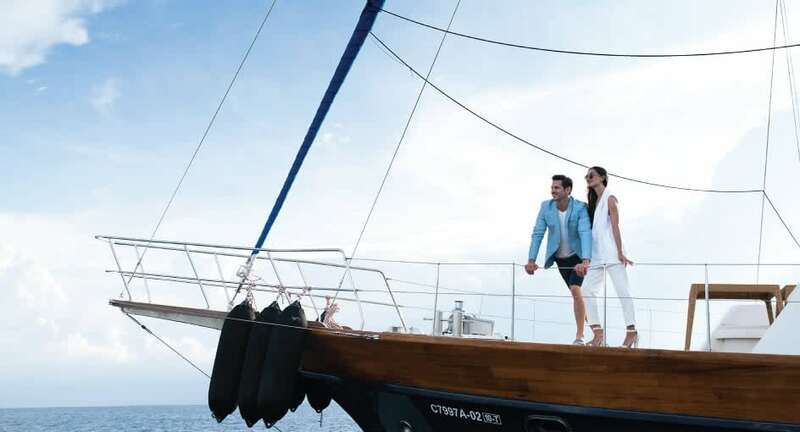 Retire to your romantically decorated room and awaken to your first glimpse of the sunrise, before enjoying a Champagne breakfast in bed, on the deck of the yacht or on a secluded sandbank. Leave with memories of your journey in a paradise of endless blue, and reminisce with wonderful moments captured on film.